Nothing prepares you to the mount of green that is in #Oman! culture and heritage of a place, and therefore was really happy to get to know that of Oman, which by the way is an ancient country! The visit to the farm not only introduced me to the culture of a place that I have repeatedly visited before – yet never managed to rub shoulders with its heritage! 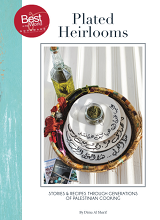 – but it also shared a slice of what life on a Omani farm feels and looks like, as well as an insight into how these women spend their time when gathering, cooking together and celebrating. Absolutely wonderful stuff! (They even showed us how the traditional Qabouli dish (Rise with meat, vegetables and boiled eggs) is made, as well as Marqooq (paper thin traditional Omani bread). I don’t want to say much as I rather leave it up to you to see and make up its beauty and effect! So find the photos in the album below and feast your eyes on the country’s green and its women’s colourfulness!